Crock-pot wassail is perfect for the holidays. Cider mulled with spices is the perfect way to enjoy a festive holiday celebration. 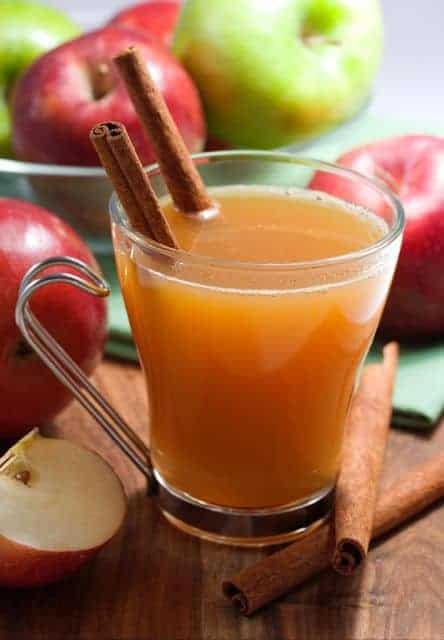 Wassail is a traditional holiday drink, cider is mulled with together with cranberry juice and a variety of spices that are known for the holidays like cinnamon, allspice, and more. This drink has its origins in medieval times even William Shakespeare was known to drink Wassail. Crock-pot Wassail Perfect for a large gathering! This holiday drink is perfect for a large gathering or house warming. This flavorful drink stays warm in the crock-pot so everyone can enjoy this spiced treat. Since this warmed drink does not contain any alcohol it is perfect for all ages. Warm up in the fall and winter with a delicious mug of deliciously warm spiced cider. Wassail is perfect for a cold winter day. In a large crock pot combine juices and sugar. Add cinnamon sticks and allspice. Poke cloves into the orange and add to mixture. Cook on high for 1 hour, then on low 4-8 hours. Love the holidays? Try these holiday-inspired drinks. Served this at my holiday party, it was a hit!